$40000 PRICE REDUCTION! 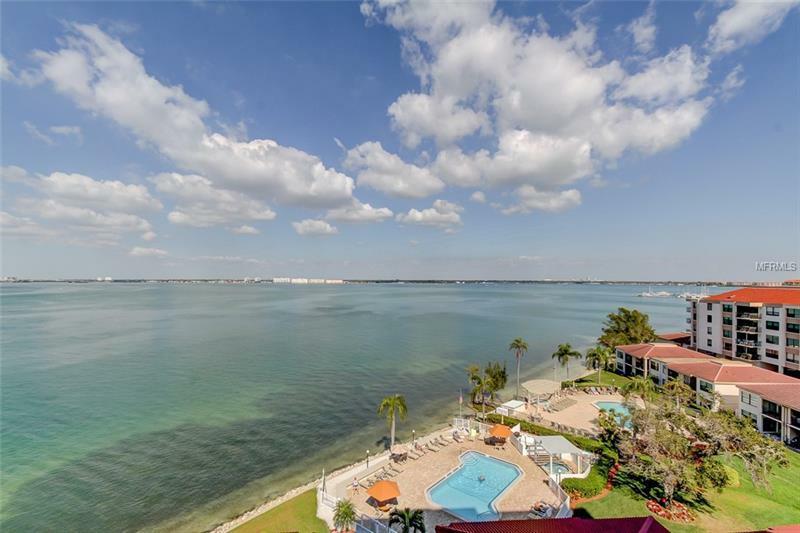 Million Dollar Views from this 2 bedroom 2 bath waterfront Barcelona unit with direct views of Boca Ciega Bay & the intracoastal. Gulf of Mexico views from the balcony as well. Watch the dolphins play & the boat parade heading out to the Gulf with a high span fixed bridge. 18â porcelain flooring in living room dining room & kitchen. Marble counters in kitchen along with stainless whirlpool appliances. Recessed LED lighting. Separate laundry room right off kitchen with room for full-size washer & dryer. Master bedroom has plank wood-look laminate and ensuite bath with brand new ceramic tile new fixtures lighting & toilet. Split floorplan for privacy of guest bedroom which also has walk-in closet. Furnishings negotiable. Highly sought after Casa G Building with amenities including waterfront solar heated pool & spa. Newly updated Club Room with pool table & big screen TV. Bike room extra outside storage extra laundry room & HOA fee now includes cable TV with Showtime & internet through Spectrum. Under building parking space #106. All ages welcome & pet friendly. 30 day minimum on rentals. Florida Living at its finest!! !